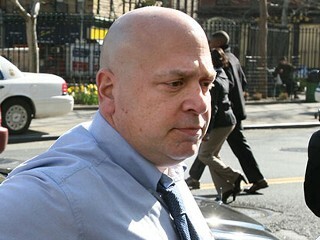 Two months ago a U.S. District Judge told Sam Israel III, "You were, in every meaning of the sense, a career criminal. You ruined lives. Financial fraud, white-collar crimes are every bit as heinous as every other type of crime and they will be punished severely." Sam Israel III, the senior managing director of the Bayou Hedge Fund Group, was sentenced to 20 years in a Massachusetts state prison for defrauding his investors of over $4o0m. Sam 3 was scheduled to report to prison yesterday, but he never showed up. His truck was found on the Bear Mountain Bridge with the keys still dangling in the ignition. A long, rambling suicide note was found under the drivers seat. With his fingertips, Sam (or somebody) had scrawled "Suicide is painless" across the dusty hood of his 2006 GMC Envoy. Here's where it gets interesting: Sam's body has not yet been found and now NBC is reporting authorities have recovered surveillance camera footage showing a second car pulling up next to Sam's Envoy, though it is "unclear from the tape whether Israel gets into that vehicle." Naturally leading some to suggest Sam may very well have staged his own disappearance feigning a leap from the bridge which spans the Hudson River near West Point. If he did in fact jump off the bridge NY State Police are confident they'll find his body, telling The Times, "The river will give him up." "Was it a tragic suicide? Or an elaborate escape plan by a convicted criminal? Investigators examining the apparent suicide of a disgraced hedge fund trader are pursuing the possibility that he purchased a black market passport over the internet and staged a jump from a New York bridge to avoid a 20 year prison sentence slated to begin yesterday."